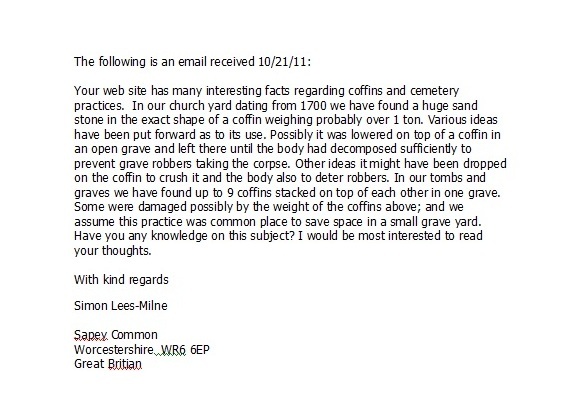 Before 1832 it was not uncommon to rob fresh graves in England. Medical students dissected dogs. Because of a need for cadavers in English medical schools there was a market for bodies stolen from cemeteries. Although the practice was condemned and unlawful, the willingness of medical students to pay for the resurrectionist's wares promoted the procedure. Freshly exhumed bodies were openly sold on medical school grounds. The cemeteries were scouted out by the resurrectionists. Following a burial they would return at night to extract the body from the grave within minutes. Normally, they would dig down to the coffin, bust it open, extract the shrouded remains, remove the shroud, and take the body away. The shroud was usually returned to the grave because it was against the law to steal it! If they did get caught they were usually beat up and possibly killed. The Resurrectionists, being one step ahead, became sophisticated and used diagonal tunnels. 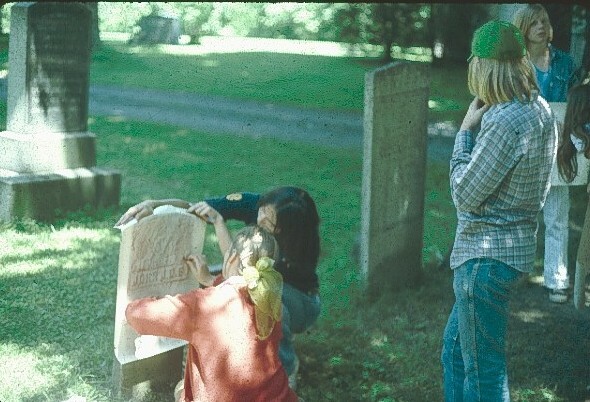 At times they would work with the cemeterian during the burial. As dirt was being put in the grave the casket was raised up. In this way, the coffin was located just below the surface so body extraction would take only minutes. Mort safes were employed. These were essentially heavy iron cages put over the coffin prior to burial. Stone houses were employed. The coffin was placed through a small door onto a giant Lazy Susan. As each coffin was added the turntable was rotated. By the time the coffin reemerged at the small door after one revolution, the body was so decomposed it was no longer of value to the grave-robber. All of this came to an end in 1832 because England passed an anatomical act that allowed people to will their bodies to medical schools. However, many of the monuments and features found in American cemeteries today are the direct result of grave-robbing activities in England. One time a mother had the intuition her daughter was not really dead and was mistakenly buried alive. She requested exhumation. She had indeed been buried alive, a most dreadful occurrence. The Bible was torn into the smallest shreds, the casket lid was scratched repeatedly, her fingernails were worn to the bone, and the hair was pulled out of her head. For a short time following that some cemeteries placed ingenious devices to warn of a live burial. One such device was a flag attached to a rope that went down into the casket. If the rope were pulled the flag would pop up so digging could begin. Can you imagine what a mess vandals could make of such a system. In any case, embalming eliminated the problem. 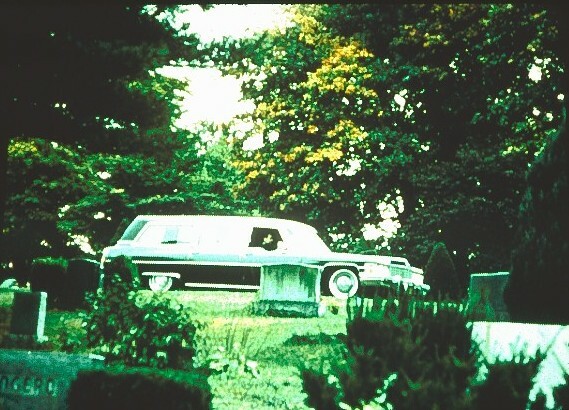 When an unidentified person dies in New York City and the body is not claimed, it is taken to Potter's Field after spending several weeks in the morgue. There is a person responsible for picking up bodies for final disposal. He takes the bodies in a closed truck to Hart Island located in Long Island Sound near the East River. To get there the truck must go over on a ferry. As a young boy I had the unfortunate experience of visiting Hart Island. There is a prison on nearby Rikers Island. The warden of the prison was a friend of my parents and had his residence on Hart Island. We were guests of the warden and his family on a gloomy Saturday. After dinner the warden's son and I went for a bicycle ride around the island. At one point, I spotted large mounds of dirt in the middle of a field. Leaving the bikes, we hiked to the mounds. Each one was next to a rather large excavation. The warden's son offered no explanation as to what was to be found at the bottom of the pits. Down the ladder we went. On each side of the pit there were wooden boxes piled four or five high. On one side the boxes were small and the other side they were larger. The odor was obnoxious and quite memorable! To this day, almost 50 years later, I can remember how I felt when it was realized we were standing in the middle of an open burial pit. This was New York City's Potter's Field! There were baby and children caskets on one side and adult caskets on the other. Identification numbers were the only noticeable markings. I scrambled out with seriously-sick stomach feelings that remained for several days. Another of my friends were also friends of the warden's family. He was younger and more daring. On another occasion they went in the pits and pried opened some of the boxes. The description of the various stages of human decay they reported was disgusting. 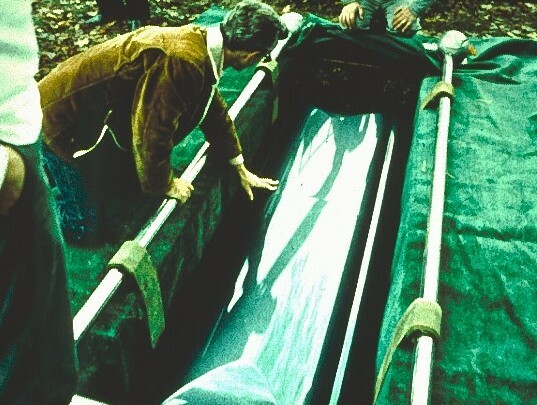 When enough bodies have been delivered to fill the side of the pit some dirt from the mound is placed on top but the ends of the caskets are still exposed. As more bodies arrive they are placed at the ends of the others. The pit is eventually filled up and then covered with a mound of dirt. With the number of burials done each week it wouldn't take too long for New York City to run out of burial space. To avoid it the burial grounds are dug up after about twenty years and the remains are relocated to a smaller burial ground. Some of the inmates of Rikers Island prison are responsible for the burial, exhumation, and reburial of the remains. In San Francisco the growth of the city was being interfered with by the numerous cemeteries. The governmental powers decided to remove most of the remains to another location: Colma City, California. Colma is a funeral city. There are funeral directors and cemeteries galore. 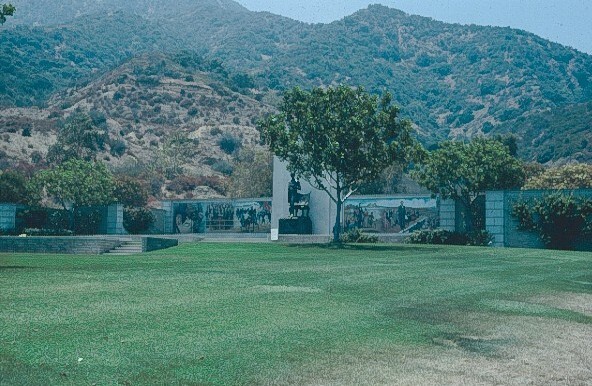 One of the most famous cemeteries is in Los Angeles. 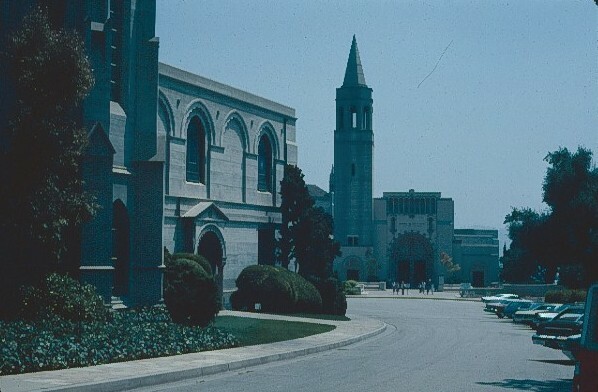 It is Forest Lawn. It is probably the finest cemetery in the world. 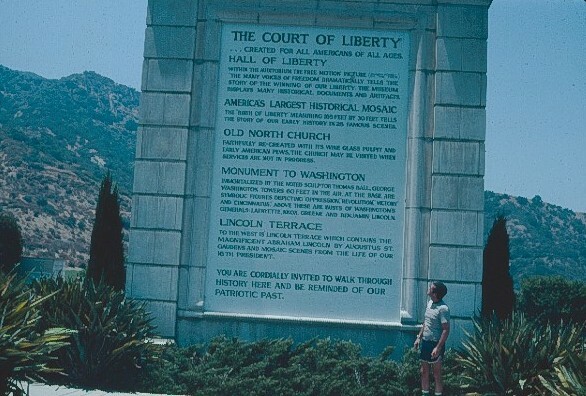 When you enter through the large gates there is a huge granite monument (pictured above) the founder, Hubert Eaton, erected. 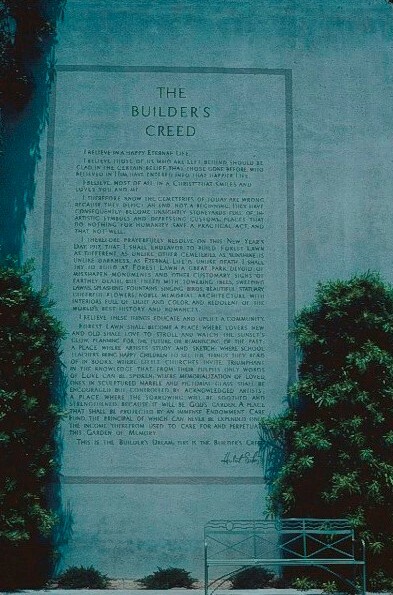 On it is the inscription that describes Eaton's philosophy concerning what great cemeteries are all about. He set out to make a complete service cemetery, one that would satisfy every need. 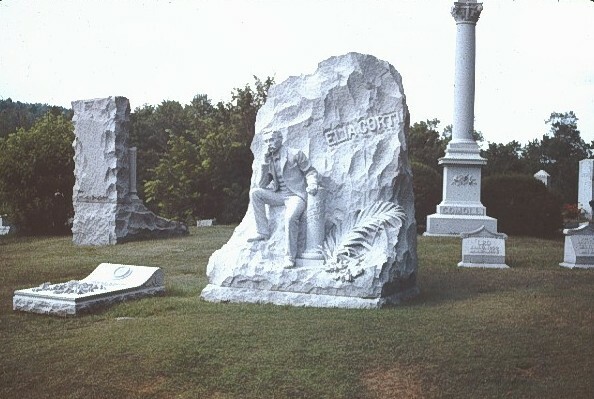 Throughout the cemetery there are monuments of every type. There are ones costing millions of dollars. There are churches, mausoleums, crematoriums, funeral homes, and funeral directors. At any time of the day one can see almost any part of a funeral service being conducted. 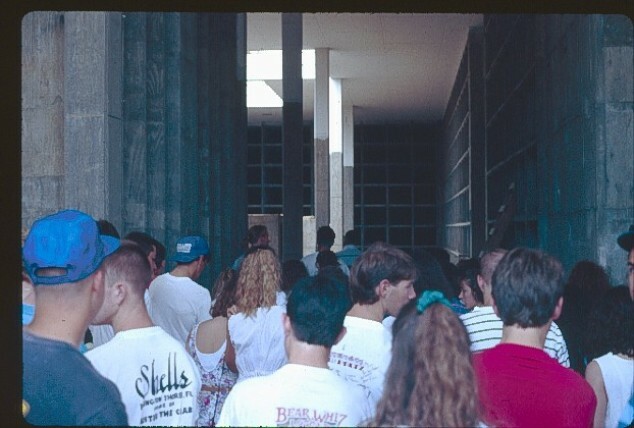 One of the mausoleums is called the "Great Mausoleum and Columbarium." It is locked to all those without a key. The interior is one corridor after another filled with crypts and niches. Next door, for a fee, one can see an hourly showing of the Crucifixion. There is a full-size stain glass window portraying the last supper. 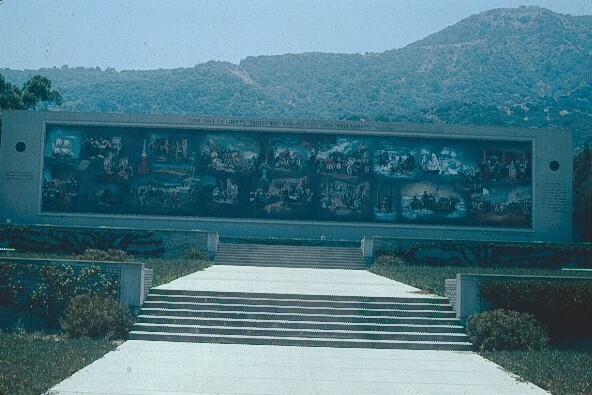 There are different sections of Forest Lawn such as the "Court of Liberty." It is mainly a lawn-type cemetery surrounded by a huge granite wall and freeze honoring America's libertarians. There are sections "Whispering Pines," "Kindly Light," "Baby Land," and "Garden of Memory." The latter is locked to the public and surrounded by a high wall. 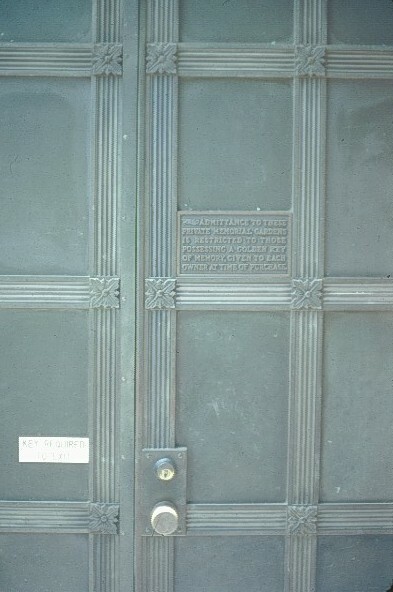 A sign welcomes visitors: "Admittance to the Garden of Memory are private. Only owners of a Garden property are permitted beyond this point." In order to get in one needs a golden key. In order to get out the same key is required. It is here that many famous people are interred. 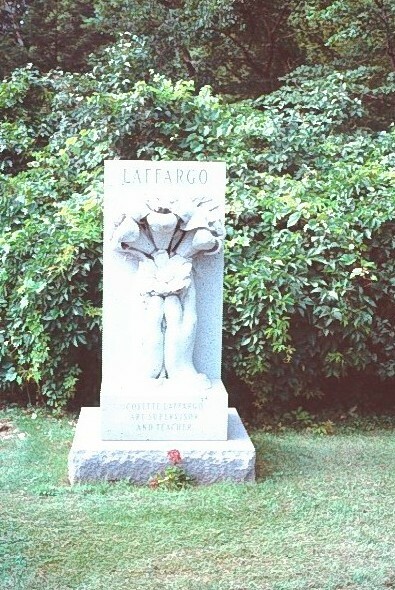 There are many statues in the cemetery. Some are famous. 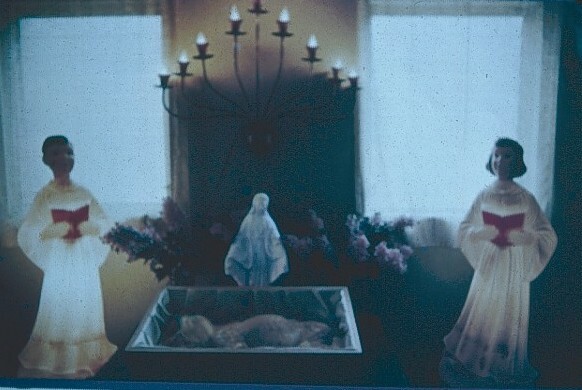 In Babyland there is a statue on a child's grave that says, "Look Mommy." 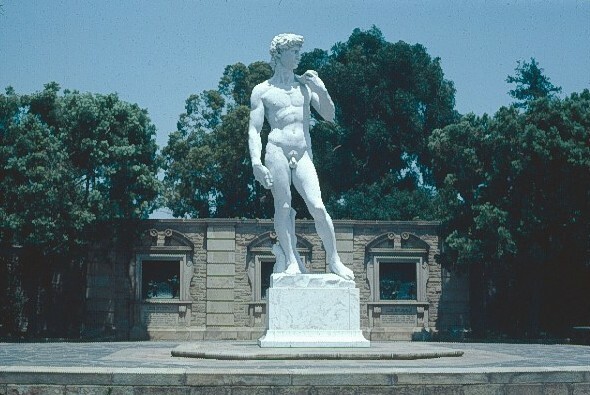 Hubert Eaton had an exact replica of Michael Angelo's statue of "David" reproduced after obtaining permission from the Vatican. 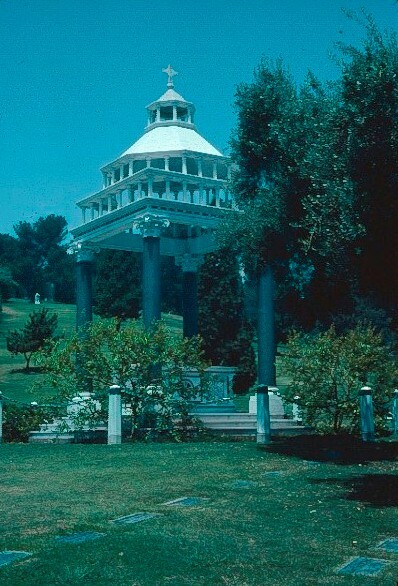 In fact, this was done twice after the first one was toppled and broken by an earthquake. 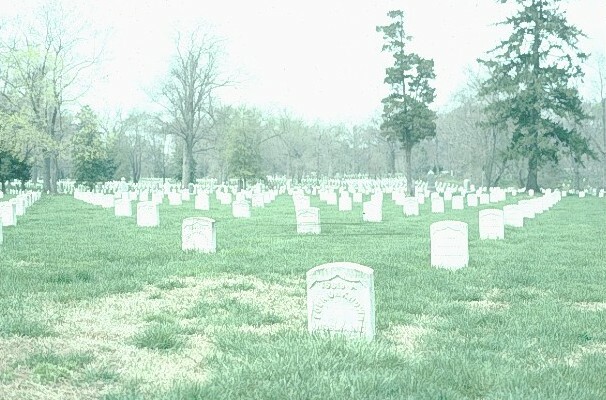 In 1862, Abraham Lincoln signed a act establishing national cemeteries primarily to inter soldiers that die in the service of the country. 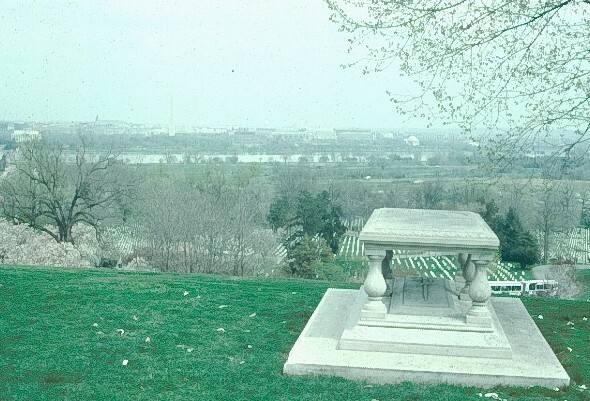 Twelve national cemeteries were established. Today there are over 125. 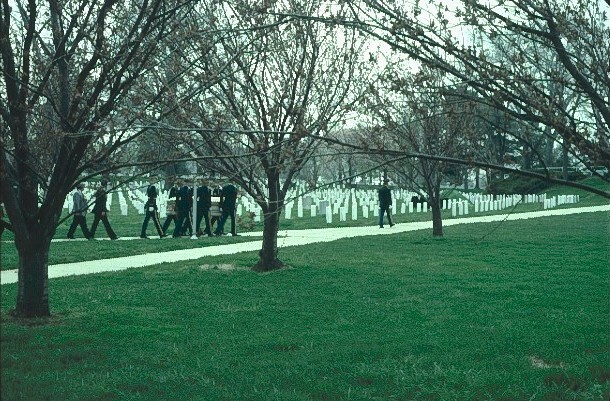 In general, to be eligible to be interred in a national cemetery a person must be a member of the Armed Forces of the US that died on active duty, or a person that served in the US Armed Forces during any war. Additionally, any member of the Reserves who died under honorable conditions while serving on active duty, and a spouse, widow, widower. 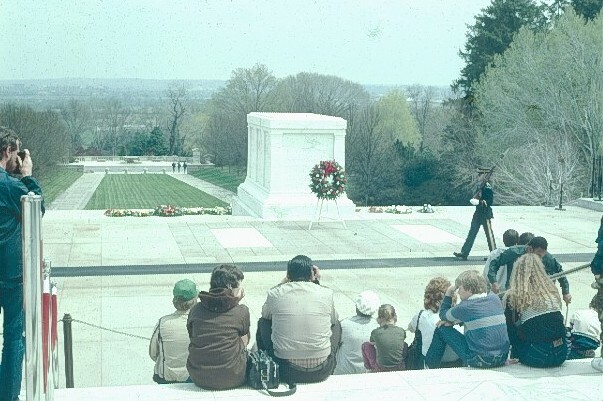 or minor children of an eligible activity duty member or veteran may be interred in a national cemetery. There is no charge for a grave in a national cemetery. 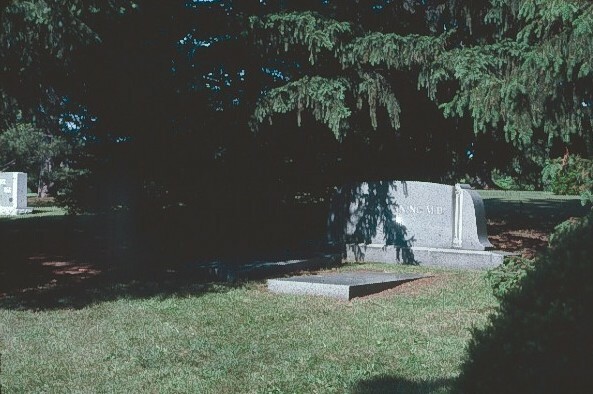 The opening and closing of the grave, as well as the headstone or marker with inscription is provided by the government. The grave sites are not reserved. Grave space is assigned at the time of need. 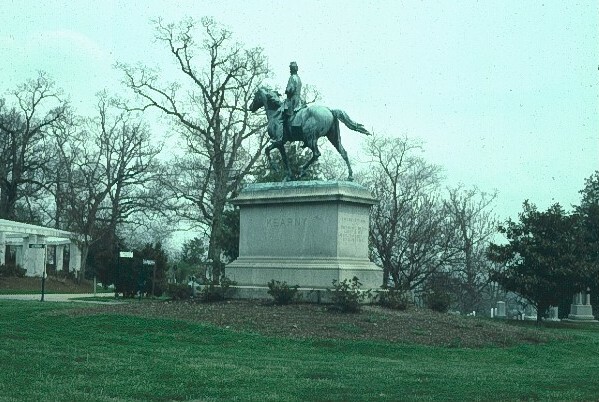 Arlington Cemetery, one of the many national cemeteries, has many statues of a horses and riders. 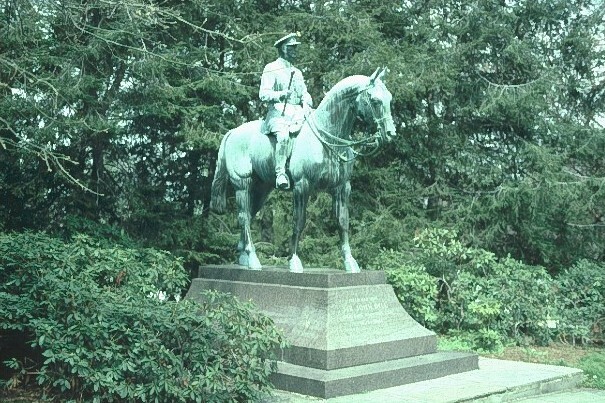 Statues of soldiers on horses are designed to show under what circumstances the death took place. If both legs of the horse are raised off the ground it means the death occurred on the battlefield. If only one leg is raised it means the person died while on active duty, but not on the battlefield. If all four legs are on the ground the death occurred when not on active duty. 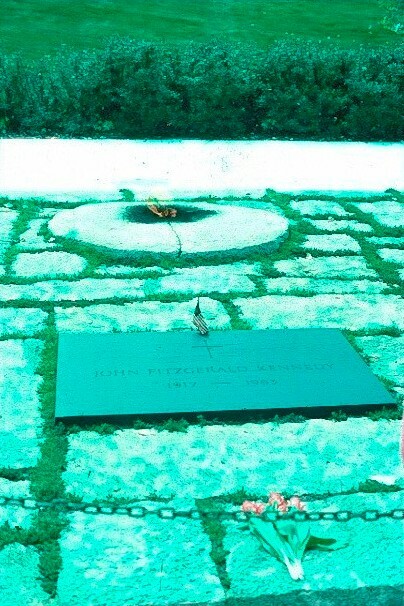 President John F. Kennedy is buried in Arlington. 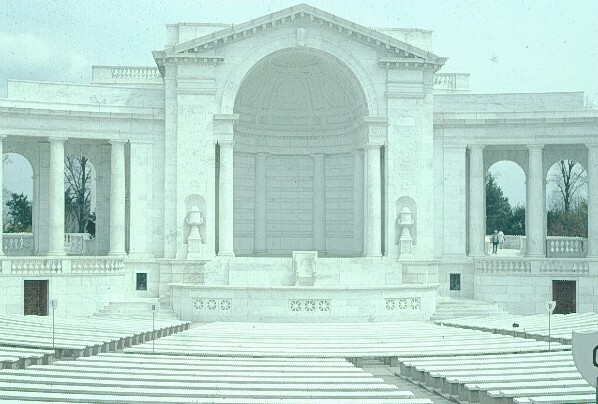 This is another of the National Cemeteries in the United States. It was developed in January 1949 within the extinct volcanic Puowaina Crater. The 33,000+ graves in 116 acres are all filled. 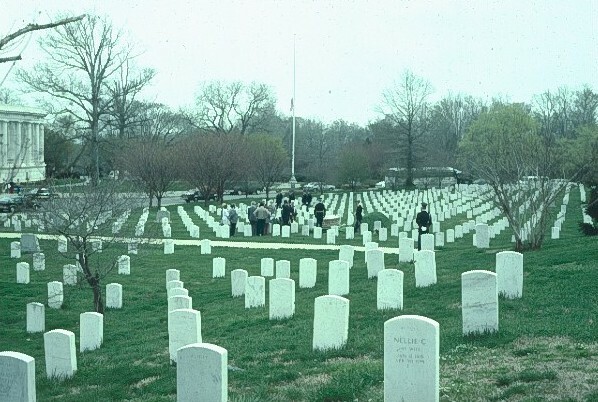 If one looks closely at the above picture many of the in-lawn grave markers are visible. 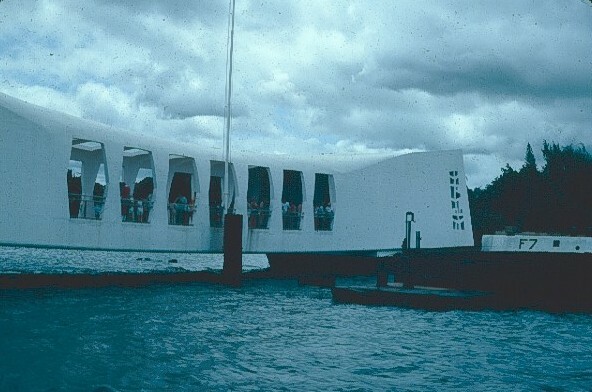 When the USS Arizona was bombed in Pearl Harbor the Navy decided it was a total loss. Many of the sailors went down with the ship and remain there today. 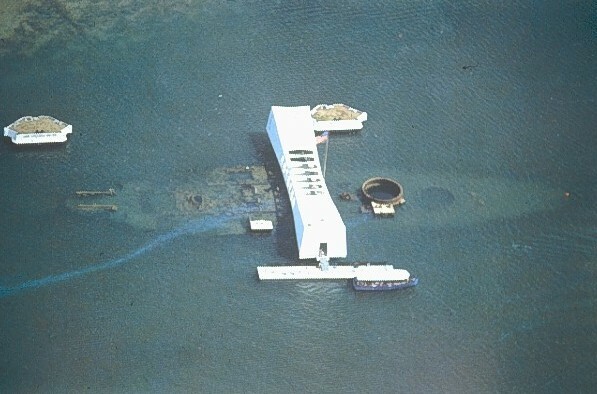 The parts of the ship that remained above the water were removed and a memorial was built over the sunken part of the ship. There were few survivors. Those that survived have the option of having divers place their cremains aboard the ship today. In the top photo one can see oil leaking from the ship and drifting away. There is an estimated one-half million gallons of oil still remaining on the ship. It has been leaking since the 1940's and the rate is increasing. At military funerals, the 21-gun salute stands for the sum of the numbers in the year 1776? 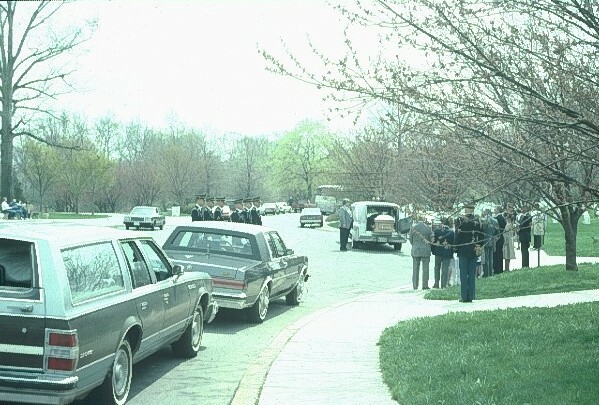 The hearse delivers the body to the cemetery. 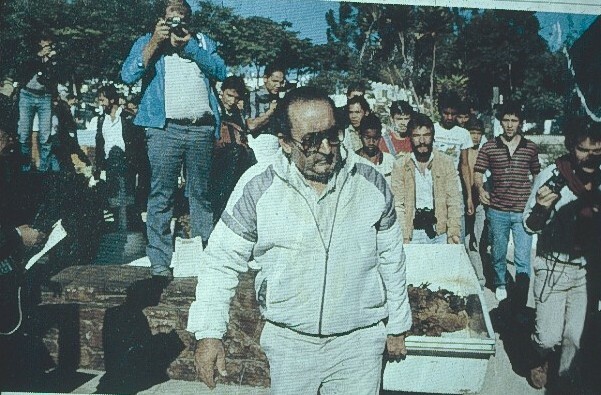 The mourners may be surrounding the freshly dug grave prior to the hearse's arrival. 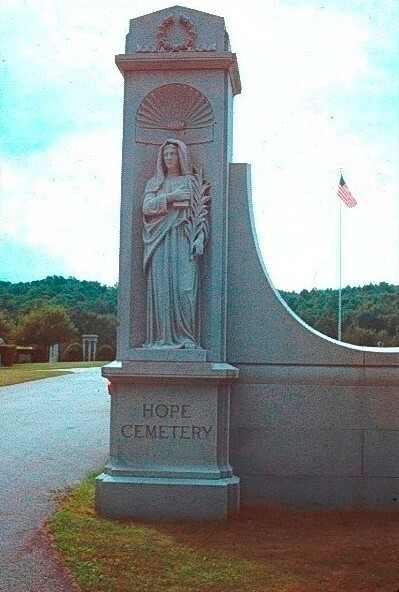 They may be asked to wait at the cemetery entrance. Or they may have their arrival delayed at the house of worship or the funeral home. 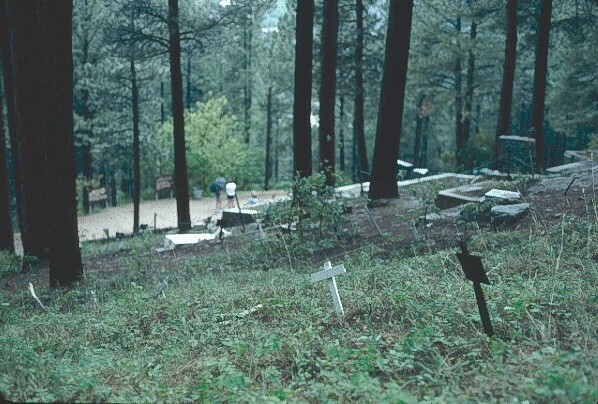 The grave site will usually be prepared ahead of time by the cemeterians. The hole in the ground and the dirt from that hole will be disguised. Flowers from the service may be used to soften the plot. The casket may be brought to the grave by pallbearers or it may be in place before the mourners arrive. The casket will be placed on a lowering device to make it easy to get it to the bottom of the grave. Lowering is done at the end of the service or after the mourners leave. 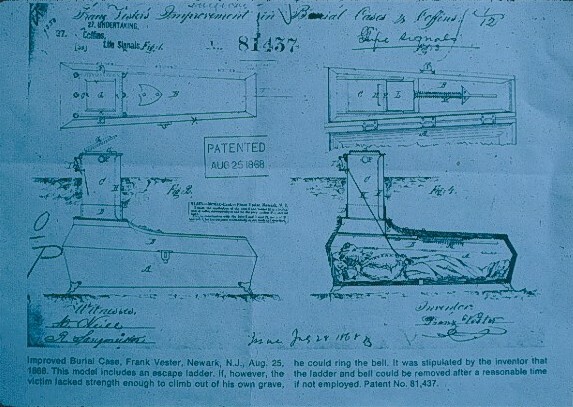 The sides of the device are allowed to roll and the straps under the casket allow it to be slowly lowered into the grave. 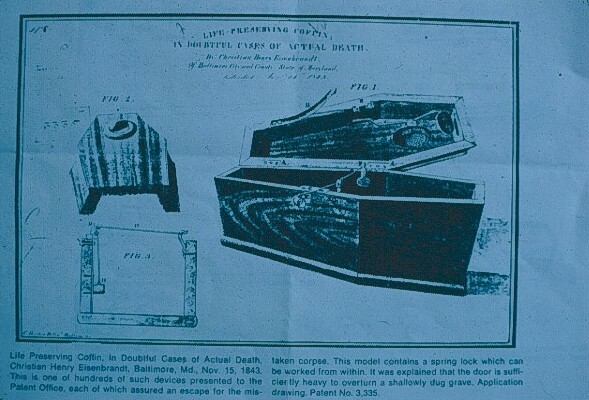 If the casket is to be enclosed in a vault the bottom of the vault will be under the casket. After the casket is lowered into the grave and into the vault the lid is lowered to make the seal. 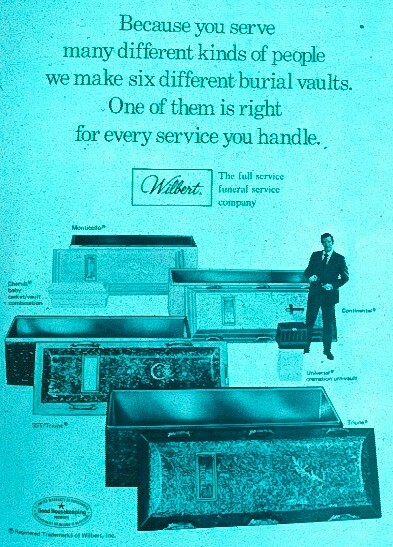 Wilbert, Inc. is a commercial manufacturer of burial vaults. Essentially they are poured concrete boxes that are large enough to accommodate the casket. Being quite heavy the bottom is usually in the open grave ready to accept the casket once it is lowered into the grave. The lid has a tongue-and-groove perimeter that matches the bottom portion. It is usually coated with tar, epoxy, or some other sealant. Once the top of the vault and the bottom are mated in the grave it is extremely difficult to separate them. There are also vaults for cremains urns. The Wilbert company offers options to make the vault more attractive and enhance its interior and moisture barrier properties. The inside may be lined with a copper or stainless box that will provide an additional wall of metal between the concrete and the casket. The exterior may be decorated with rubber icons, texture, religious figures, and name plates. 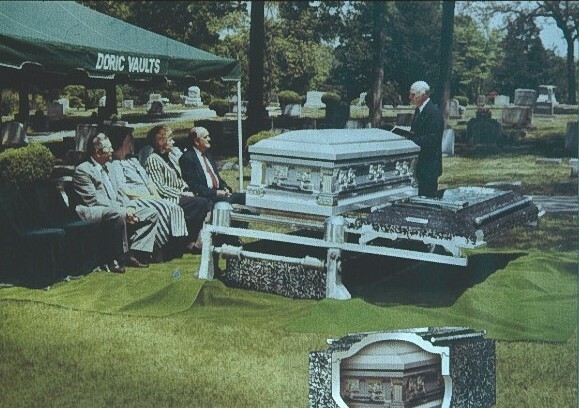 Casket burial vaults have gained in popularity because they prevent grave collapse. 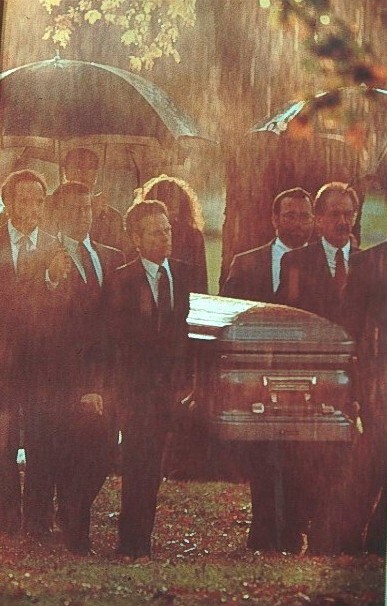 After a few years in a moist climate caskets have rotted away and the space that was inside the casket may be filled with the dirt from above. That may lead to the surface of the grave in the cemetery to collapse downward, especially in the spring when the ground thaws. 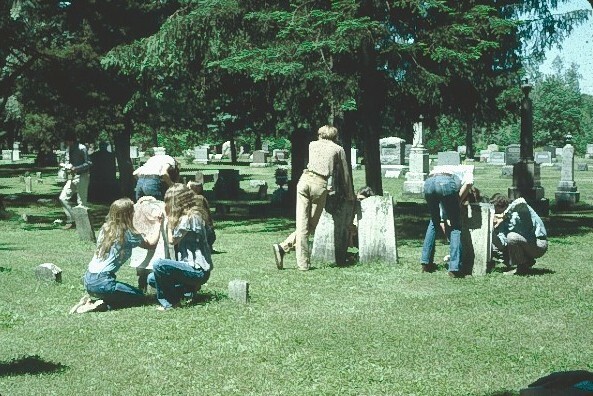 Some embarrassing moments have occurred when cemetery visitors have been part of the collapse. For that reason, many cemeteries "require" burial vaults and if one protests they may be limited as to where the burial will take place. 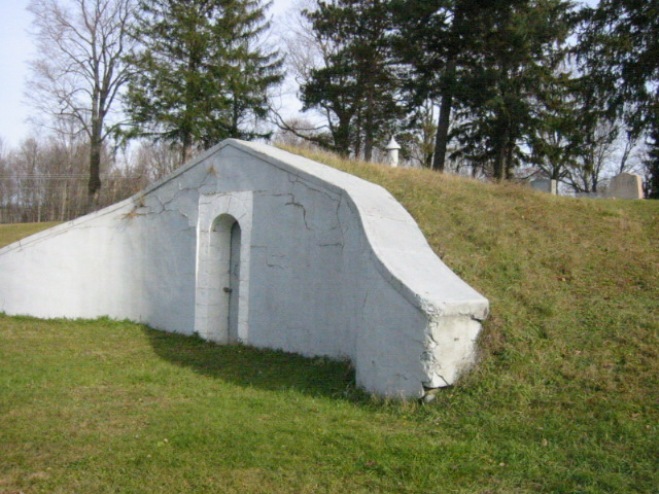 Some cemeteries manufacture their own vaults and make them available at a lower cost. 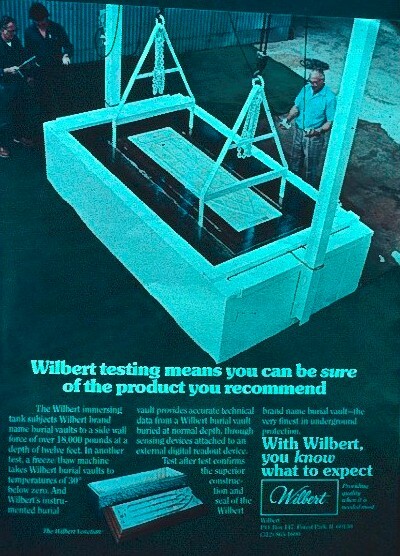 The above Wilbert advertisement indicates that their burial vaults are capable of withstanding hugh forces and a variety of temperatures without failure. They also indicate the vault provides protection from water entry. In all fairness, there have been some exhumations where the vaults, of whatever brand, were cracked and/or had water inside them. Although the Poughkeepsie plant is no longer there, when we visited there were large vats of concrete moving across the ceiling. They were used to fill the molds for the bottoms and the lids of the burial vaults. 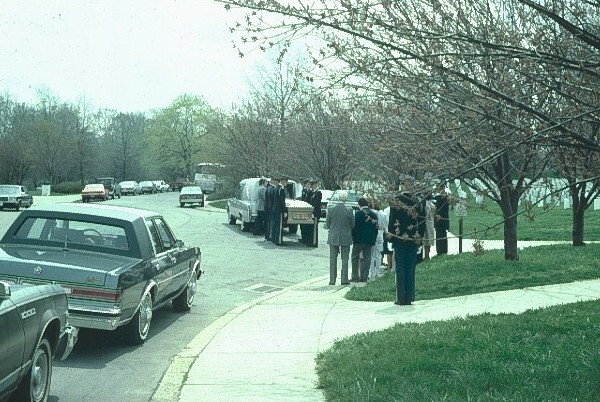 As a general rule, vaults are too big and too heavy to have one displayed in the funeral home. In lieu of that, a model such as the one above may be presented instead. If you look closely you will see how the lid fits to the bottom, how thick the Wilbert vault is, and how the top may be decorated. 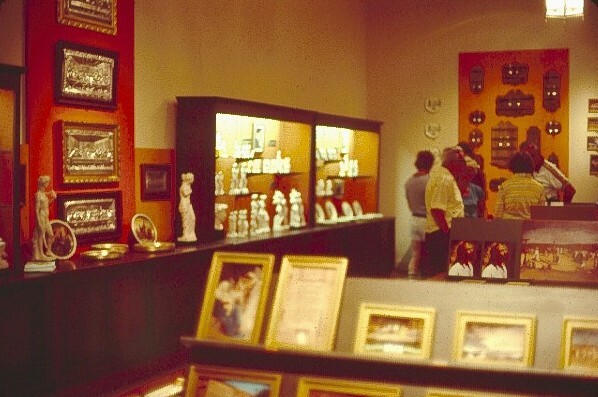 Just to the right at the top of the photo is a partial picture of a cremains burial vault. 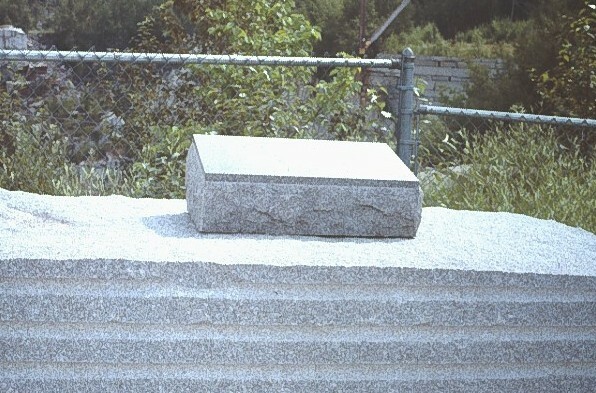 In Barre, Vermont there is a quarry of granite that is mined to provide monuments for cemeteries. 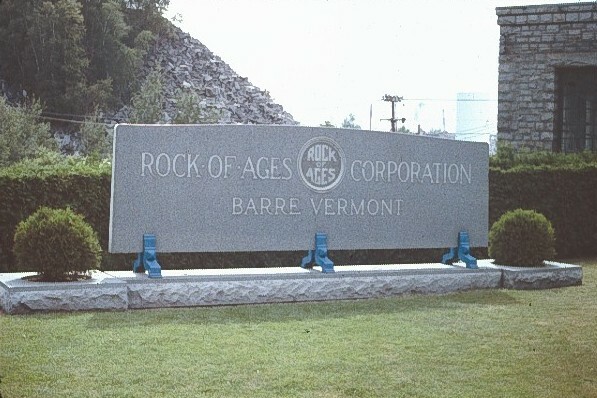 This is the home of Rock of Ages. 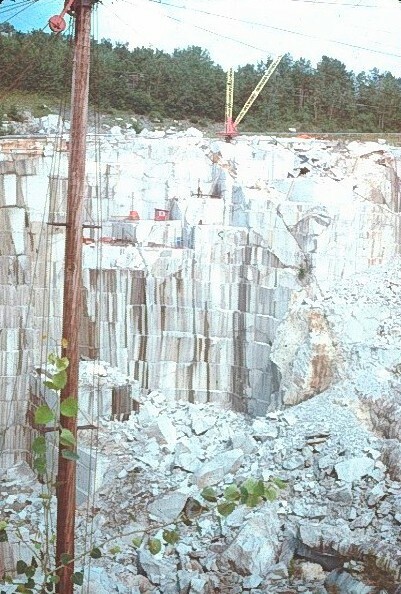 Notice the small shed and dynamite driller on one ledge, and the crane to lift the slabs from the quarry. The following 2 photographs are taken from the pages of Time Magazine. The location of the monuments is unknown. 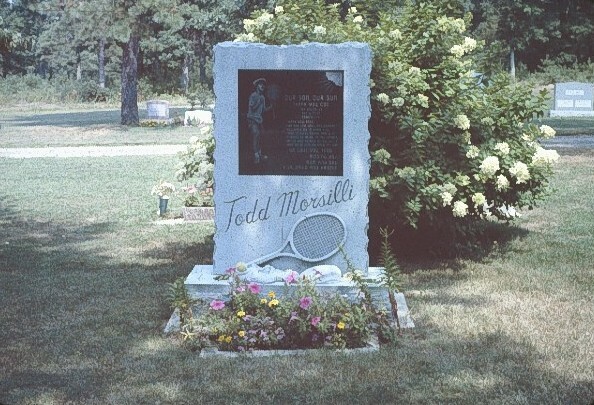 Richard Todd Morsilli was a teenage tennis player when he died. 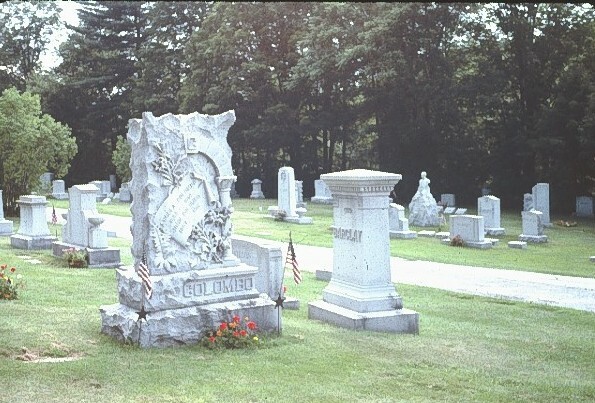 This monument in Lloyd Cemetery, Lloyd, NY was ordered by the wife as you see it. It is purposely unfinished because the husband never finished any projects. 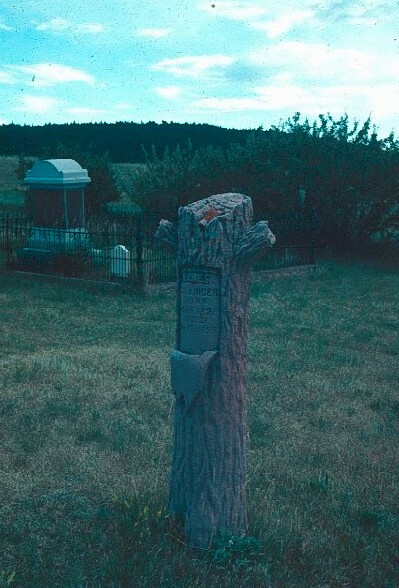 The Auchmoody burial plot in Lloyd. Oxen were used to transport the massive granite ball from the train to the cemetery. 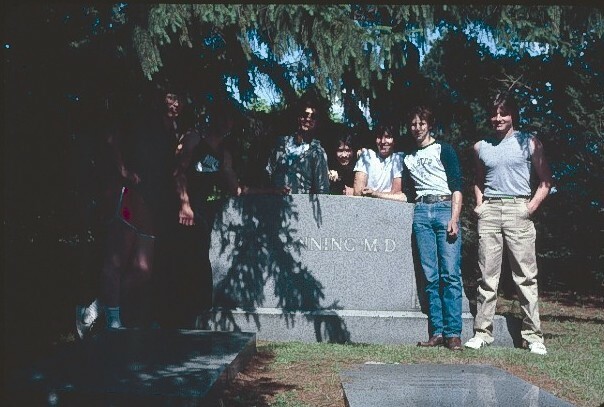 Dr. Dunning is buried in Cedar Hill Cemetery in Newburgh, New York. He was a prominent physician and left his wife well-off when he died. 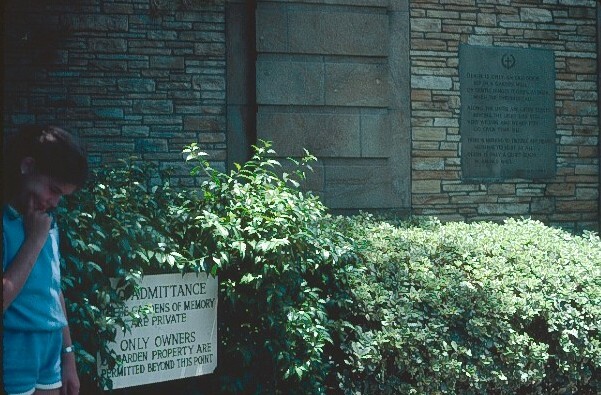 In front of the monument there were two crypts dug and covered with granite slabs. He was placed in the left one. Dr. Dunning's wife allowed local attorneys to manage her money. By the time she died there was so little money remaining the cemetery could only lift the right slab and place her casket in the collapsing grave shown by the sinking of the stone above. 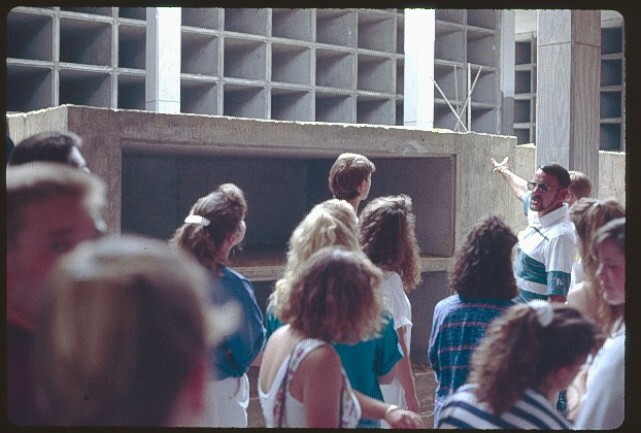 George Mocko, the Cedar Hill Cemetery Superintendent at the time, is shown explaining the problem to one of the classes. In later years the cemetery repaired the grave at their expense. 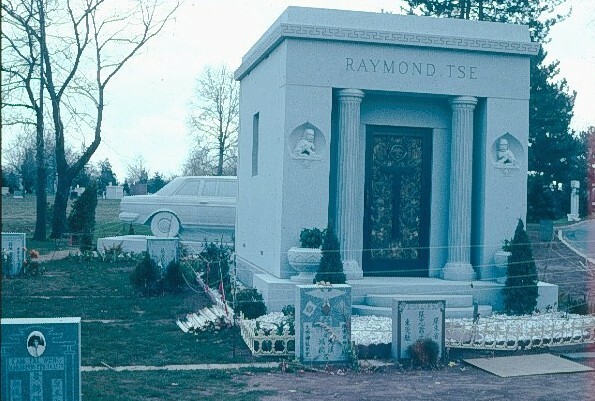 When 15-year old Raymond Tse died in a car accident his father was determined to erect a monument to his memory that would please his son. 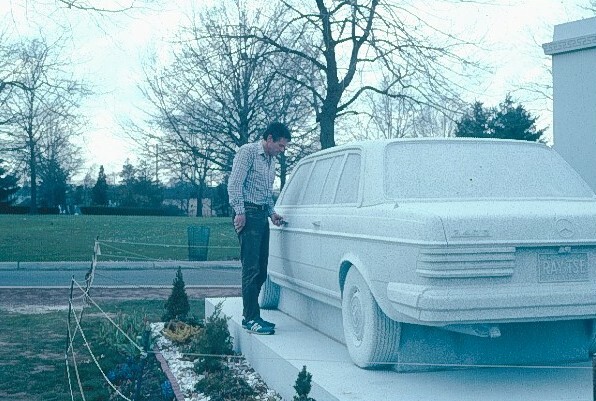 He contracted with a quarry in Vermont to produce a full-size Mercedes carved out of a 66-ton solid block of granite. 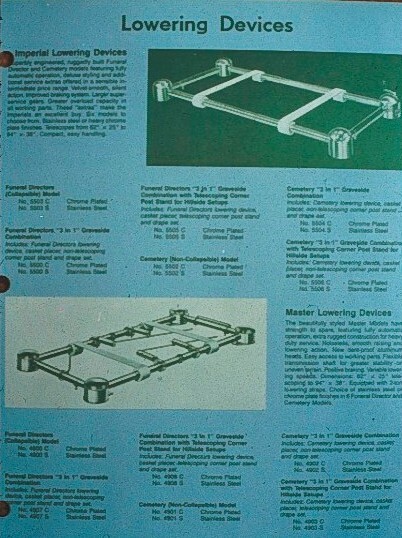 The cost was about $250,000 in 1983. 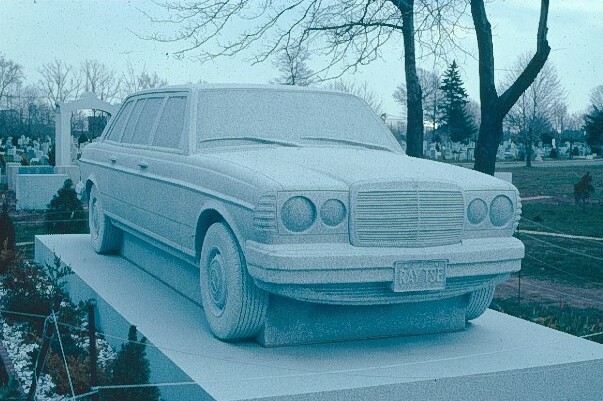 The car was shipped to Linden, New Jersey and placed next to the son's 4-crypt mausoleum. The 1982 Mercedes Benz 240-D stone replica is complete down to the license plates reading, "RAY TSE." 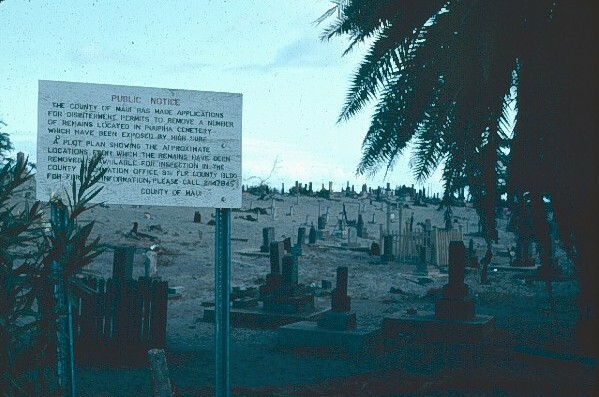 On Maui, Hawaii the high tides exposed some of the caskets in the beach cemetery and they had to be removed as the sign above states. 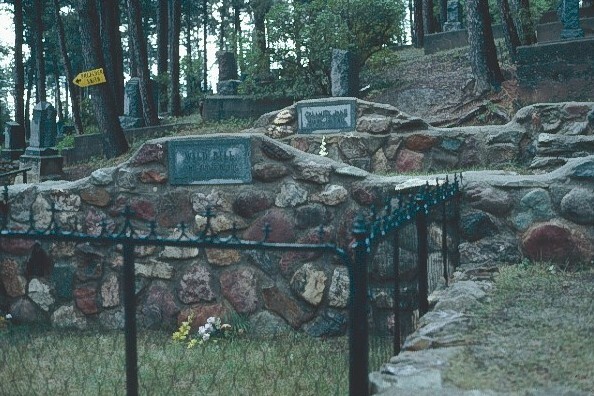 Many of the older graves in Deadwood are of children. Disease took its toll back then. 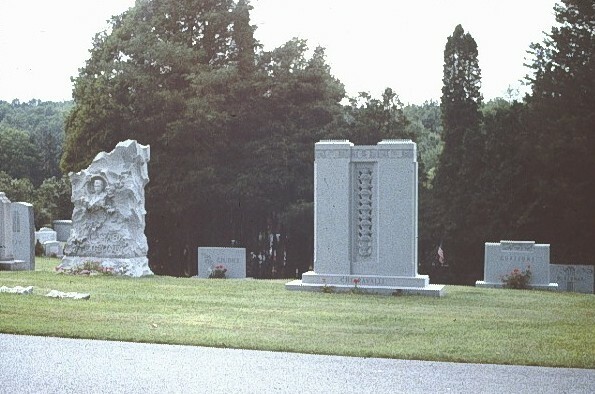 On the left is a 4-crypter mausoleum in Lloyd, NY cemetery with the inscription, "Our Son" inscribed at the top. 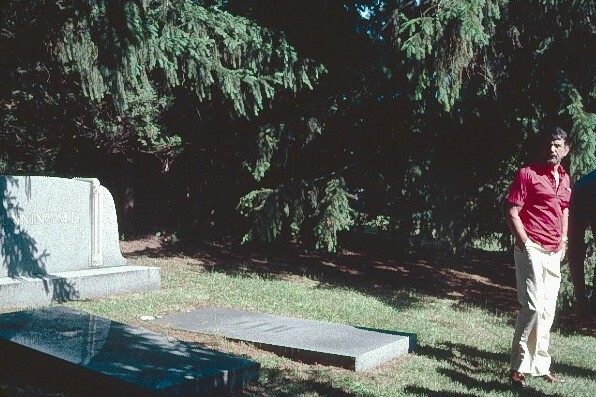 On the right is the Aspenwall mausoleum in the Cedar Hill cemetery. It is worth over $1,000,000 and has granite steps that are quarried from 1 piece of stone. 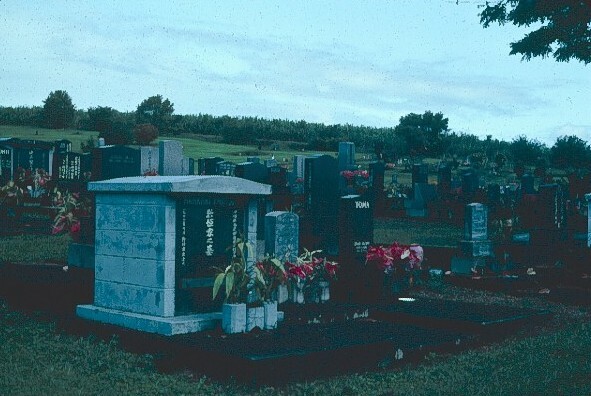 The Japanese mausoleum in Hawaii is for the interment of cremains. Left on many of the graves are little gifts and partly burned money. 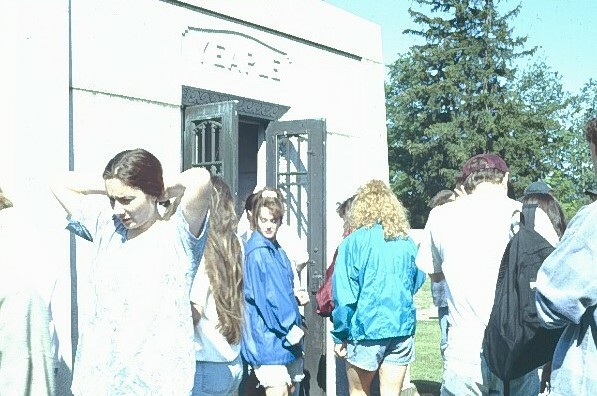 The Yeaple 6-crypter mausoleum in New Paltz, NY cemetery. The students are touring the inside during one of the class field trips. Woodlawn Cemetery Mausoleum in New York. George Mocko, past Superintendent of Cedar Hill Cemetery in Newburgh, NY explains the entry to the mausoleum during a field trip. Cedar Hill Mausoleum exterior on the left has granite plates covering the crypts. Interior on the right has marble plates. 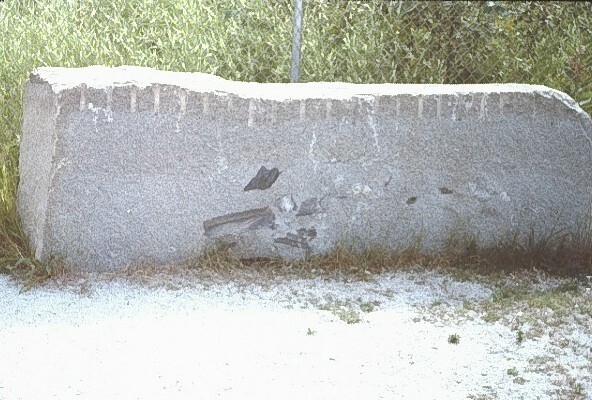 Marble on the exterior would deteriorate. 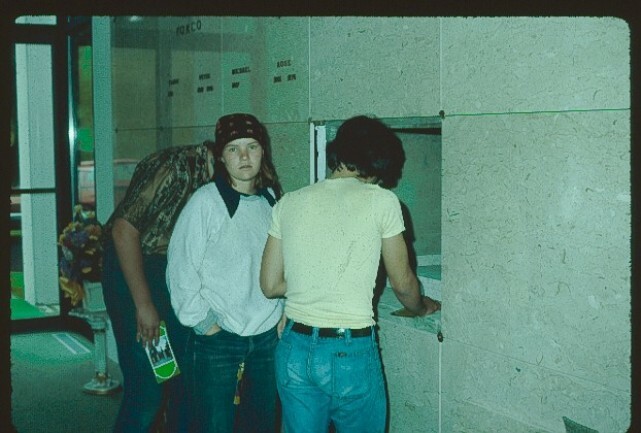 On the left is a photo of students peering into single crypt in 1976. 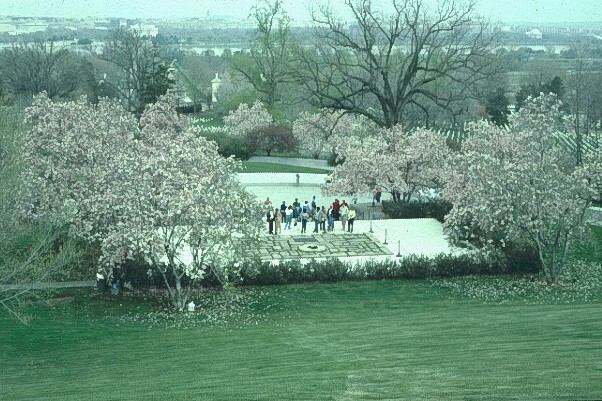 On the right is a May 1991 photo showing the construction of an addition to the mausoleum. 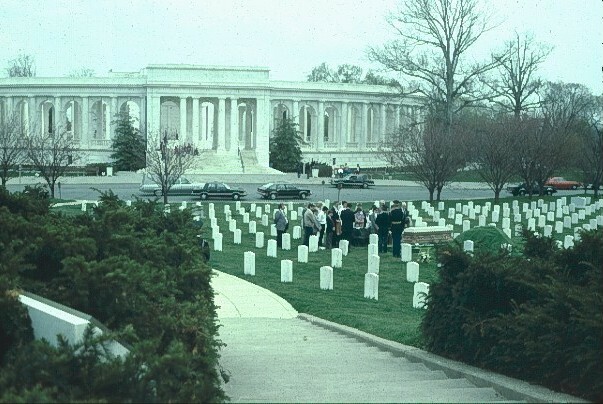 The individual crypts may be purchased as singles, end-to-end, and side-by-side. The cost of the crypts depends on level. The ones at the bottom or under the floor are usually lower in price than the ones high up which are lower in price than the most expensive ones at eye level. 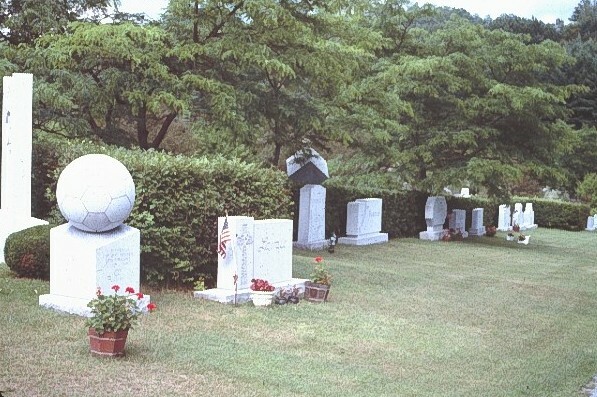 As anyone knows after visiting a large cemetery, there are a myriad of monuments dedicated to the memory and location of the deceased. The inscriptions usually contain the name of the person, the birth date, death date, possibly the age, and an inscription for religious purposes and/or for memories of the life once lived. Some are quite unusual. Some are quoted from "The Last Word" by Gyles Brandreth. He lies Lester Moore, four slugs from a 44. No less, no more. Played five aces, Now playing the harp. Here lies the body of our Anna, Done to death by a banana. It wasn't the fruit that laid her low, but the skin of the thing that made her go. Here lies the body of Mary Ann Lowder who burst while drinking a seltzer powder. Called from this world to her heavenly rest, she should have waited till it effervesced. Underneath this pile of stones, Lies all that is left of Sally Jones. Her name was Briggs, it was not Jones, But Jones was used to rhyme with stones. Here lies the body of poor Aunt Charlotte. Born a virgin, died a harlot; For sixteen years she kept her virginity. A damn'd long time for this vicinity. Mr. Gilding was killed with an axe by an insane brother. Here does lie the body of John Sly who did die by a sky rocket that hit him in the eye socket. Here lies John McPherson who was a very peculiar person. He stood 6 foot 2 without his shoe and was slew at Waterloo. Here lies John Racket in his wooden jacket. He kept neither horses nor mules. He died like a dog and he left his money to fools. The little hero that lies here was conquered by the diarrhea. Opened my eyes to the peep, didn't like it, went to sleep. George Johnson - Hanged by mistake. School's out. Teacher's gone home. Been here and gone. Had a good time. In loving memory of my beloved son, Jesse James, Died April 13, 1882, 34 years, 6 mo, 28 dys. Murdered by a trader and coward who name is not worthy to appear here. 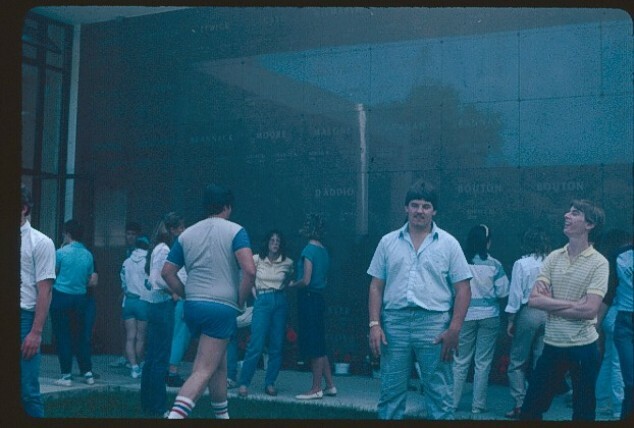 Ronald Brodsky on the left and the author on the right during a school field trip. If there is a severe winter where they are unable to break through the frost in the ground, which was common in the past with inferior digging equipment, the bodies were stored on the cemetery grounds in unheated buildings designed just for that. In the spring the formal burial would take place. As the class walked by the many graves it was pointed out that the headstone is usual the main monument on the grave plot. There may be foot stores for individual members of the family. There may be small square stones, flush with the ground, marking the boundaries of the plot. One of the cemetery's main concern is grave collapse. If a casket is put into moist ground, no matter what it is made of, it will disintegrate in 25 years or less. The casket collapses from the weight of the soil on top of it. Then the grave collapses especially after the frost leaves in the spring. 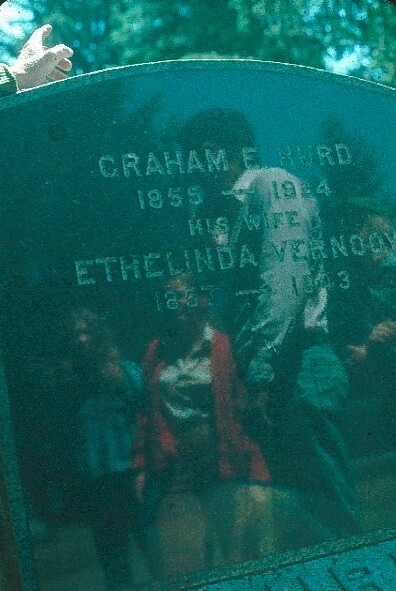 People standing at the grave site have been injured by the depressing that forms. 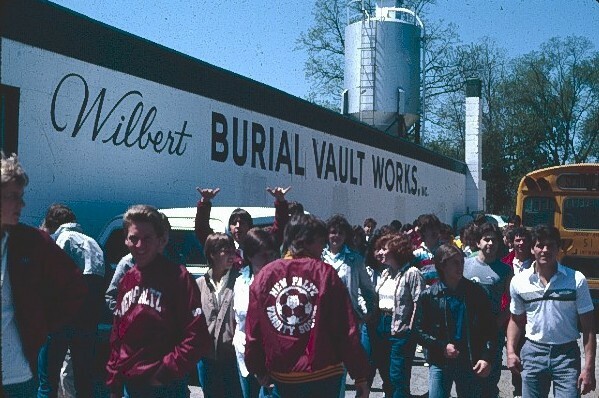 For that reason, many cemeteries require the body be buried in a rigid container such as a concrete burial vault. 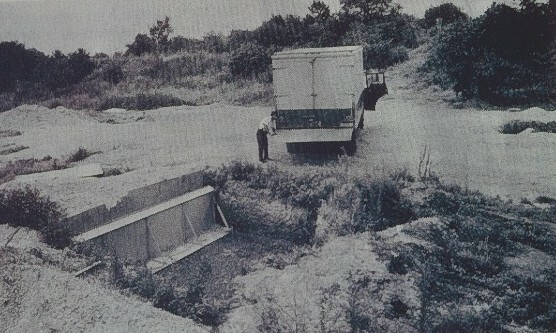 After the grave is dug the extremely heavy vault is lowered into the hole. It weighs about 1400 pounds. The lid is stored elsewhere. It weighs about 600 pounds. When the casket arrives at the cemetery the bottom section of the vault is already in the grave. 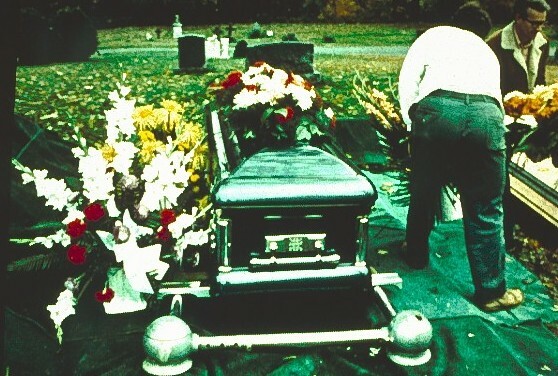 The casket (or some type of burial container) is placed on lowering straps over the grave when it arrives at the cemetery. 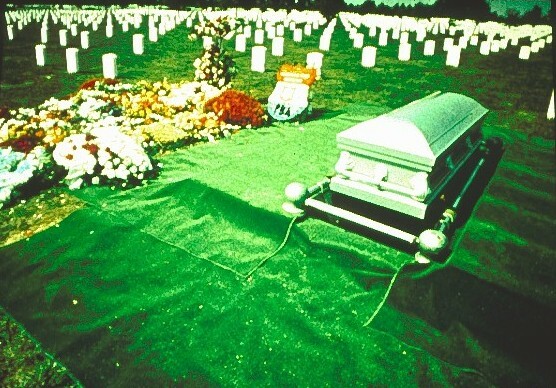 Quickly green cloths are placed around the bottom of the casket so the hole and vault are not visible. At some time at the end of the funeral the casket is slowly lowered into the vault and the lid is then lowered with a block and tackle device to the top of the part that holds the casket and a seal is made. The seal is supposedly waterproof and is either epoxy or asphalt. Once the lid is attached it is very difficult to remove. To illustrate this, a local funeral director told me the story of a husband that wanted the ring removed from his dead wife's hand prior to burial. 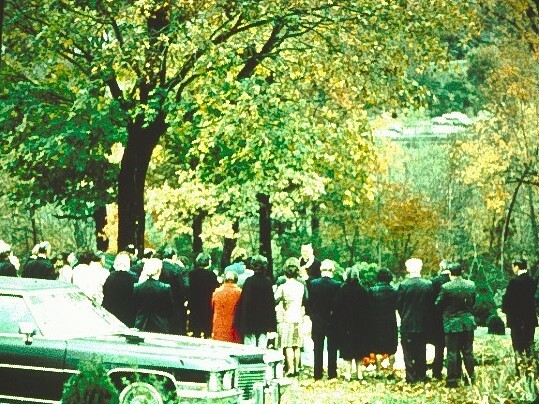 As the funeral party was exiting the cemetery, the husband requested the ring from the funeral director. Unfortunately the ring had been left on the wife's hand and now was sealed in the vault. In order to retrieve the ring they had to get a crane and hoist the vault by the lid from the ground. 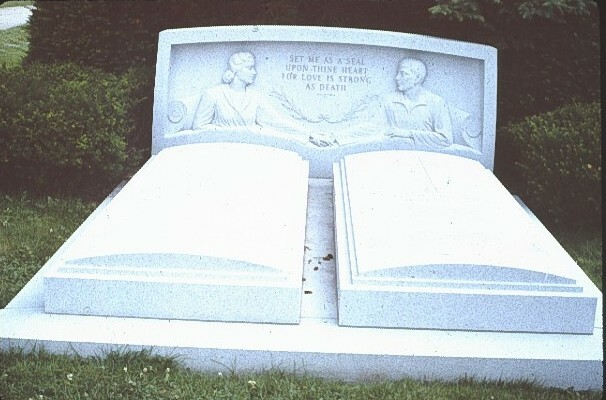 The lid was so tightly sealed to the bottom they both stayed together as the unit was raised from the grave! Backfilling the grave is begun. 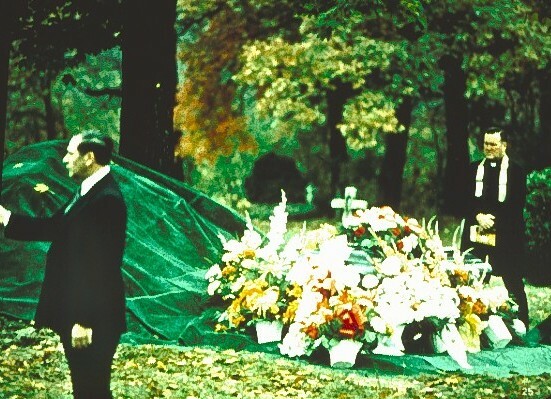 The bare dirt on the surface may be covered with sections of grass that were removed prior to the gave being dug, or flowers from the funeral may be placed of the dirt. The dirt eventually will be seeded. The first impression is that the cemetery requires the use of a vault. In most states this is not really the entire story. For those that insist on not wanting a vault, or cannot afford one, there is usually a section of the cemetery that will allow burial without it. That section may not be the choicest site, and it would eliminate the possibility of selecting elsewhere in the area. The depth of a grave is not necessarily 6 feet. The bottom of the hole may be six feet but it depends upon the organizational plan of the cemetery, the type of soil, and if more than one person is to be buried in the same hole. 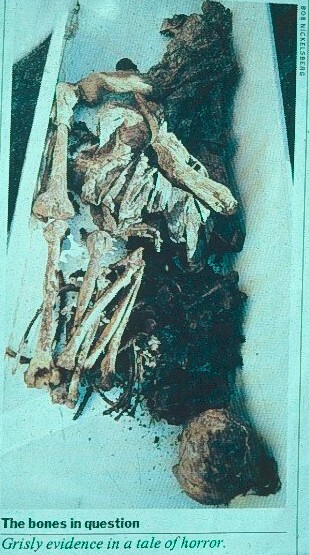 At some locations bodies are buried vertically in threes! If a monument is to be placed on the grave site it will be done at a later date. The monument will have to be inscribed with information and this is usually done by blasting a very hard grit on to the stone to wear it away in order to produce a letter. To keep the rest of the stone around the letter from being worn away the stenciled letter (or symbol) is cut into a heavy rubber mat. The abrasive bounces off the rubber buts blasts away the stone. 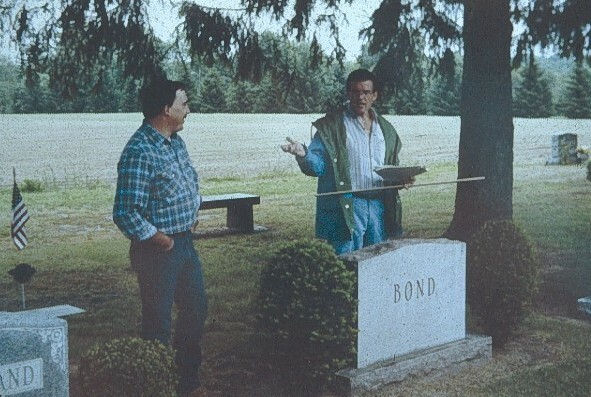 If information has to be added at a later date (a new death being added to the same grave) it is done at the cemetery. 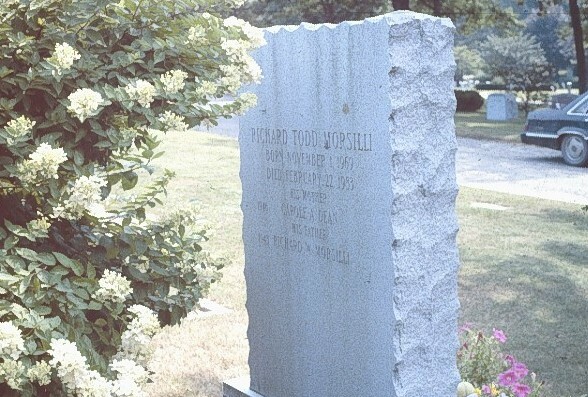 Also, the monument must be placed on a sturdy foundation to prevent frost movement, sinking, etc. The cemetery will provide that prior to the monument's arrival. The footings in New Paltz Cemetery are no less than 10" thick. Monuments are not on the interment and they are about 2' from the top of the grave. Foot markers are usually 1' from the bottom of the grave. Monuments are best if they are made of granite. 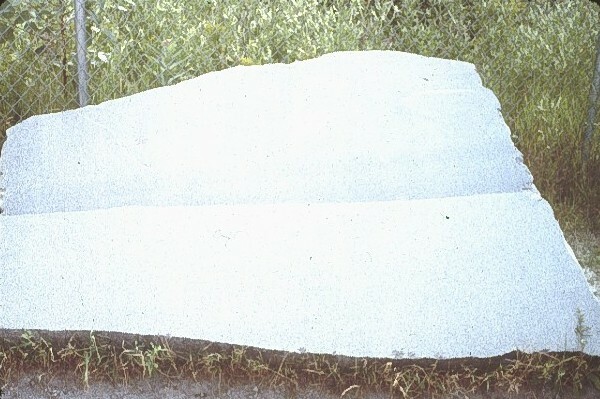 Monuments made of marble or limestone are highly affected by acid rain and will become illegible after years of exposure. Sandstone is a bit better but it is a sedimentary rock, might have layering and subsequent separation along the boundaries Granite weighs 2.7 grams per cubic centimeter. Using a monument that is 2' high, 3' wide, and 8" thick would convert to 674 pounds! A that is considered a small monument. 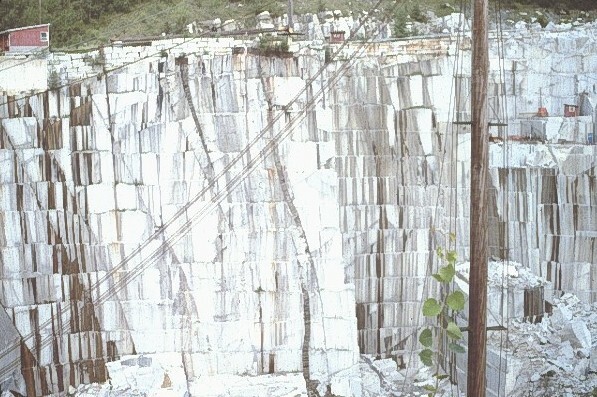 Granite may be left uncut leaving a rough edge. It may be cut leaving a smooth edge, or it may be cut and polished leaving a glossy finish. Many have combinations of the three. 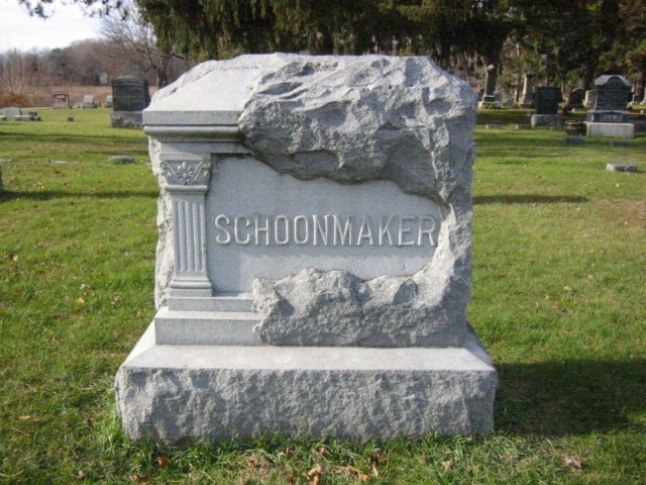 The Schoonmaker monument in the Lloyd Cemetery has an extensive area around the inscription that is rough. Mr. Schoonmaker's wife did that because he never finished anything he started. Adding pictures and lettering using color, especially red, will fade in a short time. There are about 1500 plots per acre in a typical cemetery. There may be as many as 1800 if is a lawn-type cemetery without gravestones. The yield can be as much as $5 million per acre. 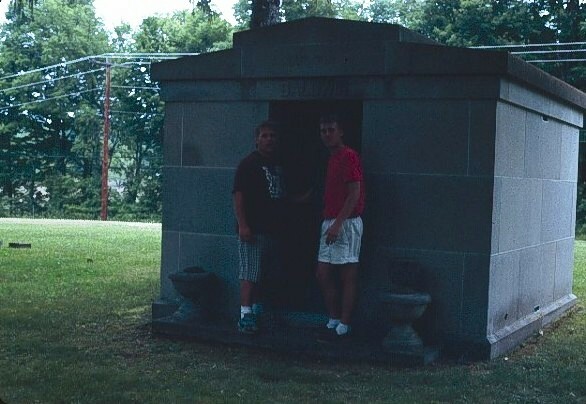 A mausoleum, such as the one at Cedar Hill, allows many more interments per acre. They have single vaults, side-by-side doubles, double end-to-end, and walk-ins. Prices vary according to the type and the height. Maintenance is a big cost to the owners of the cemetery. Lawn cutting, especially around the monuments is time-consuming. In fact, about 75% of the maintenance costs may be save in a lawn-type cemetery. Above ground burial is becoming popular. If it is a building, usually of granite, and can accommodate 2 or more caskets it is called a mausoleum. 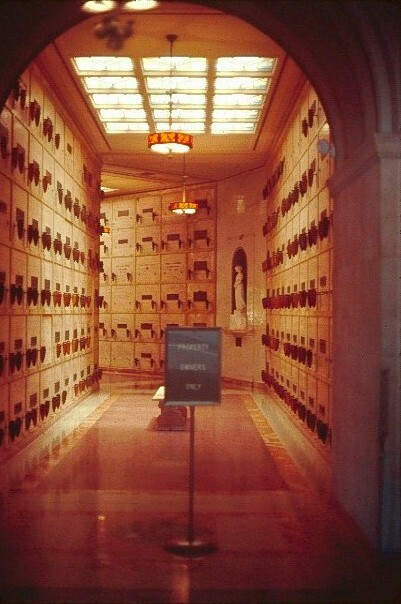 Each of the places the caskets go is known as a crypt. 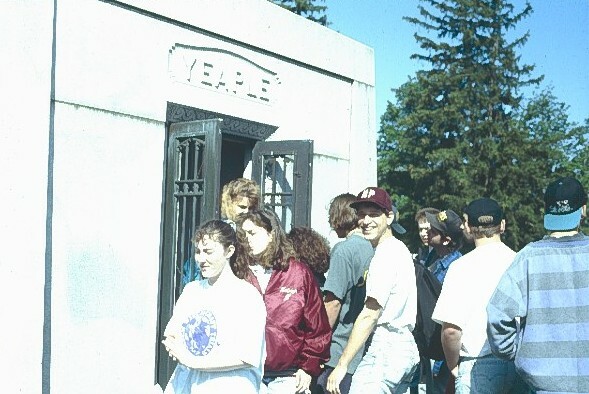 The Yeaple mausoleum is a 2 crypter. 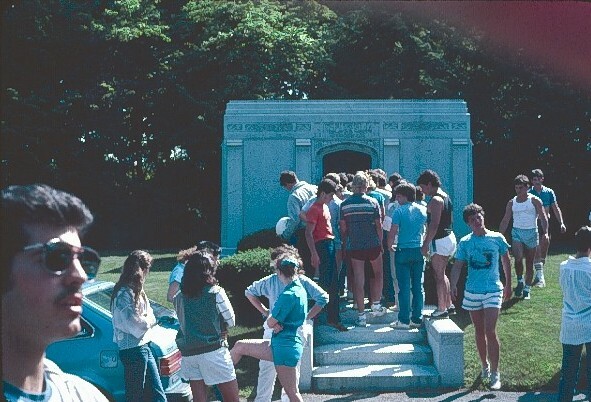 The McKinstry Mausoleum is a 6 crypter, walk-in mausoleum constructed of Barre, Vt. granite. The cost: Minimum $300,000. The foundation: Minimum $65,000 and it must be 6' in the ground. A cemetery reflects the community's basic beliefs and is considered sacred earth. A funeral is time-bound; a cemetery is a timeless place that unites the living with the dead. "I am the resurrection and the life. He who believes in me will live - even if he dies. And, all who put faith in me will never suffer eternal death." Before heavy machines were available to break through the frozen ground, bodies were stored in unheated areas within the cemetery. Above is a concrete room that is covered with soil and grass. This was used to store bodies during the cold of winter until the ground could be opened for burial. Notice the gas vent at the top and lock on the door..
Daisy the deer was found as a fawn near the remains of the dead mother. The fawn was raised and cared for by a farmer living across from New Paltz High School. The local conservation department found out about the illegal harboring of Daisy, a foreign animal. They came to the farm to "free" Daisy and return her to the wild. To do that they fired a tranquilizing dart in the animal and that killed her. 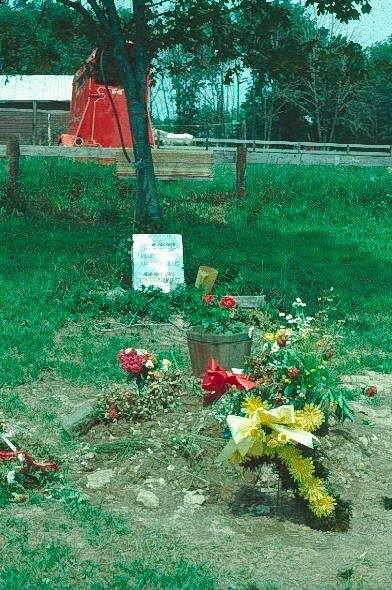 The farmer buried Daisy near the road in front of his farm. Newspapers and television reporters were present and gave the incident wide coverage. 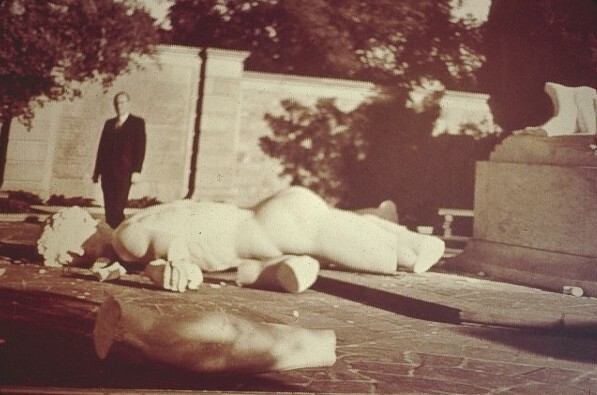 The wooden monument in the background says to the effect, "Here lies the body of Daisy the deer, killed by the Nazi tactics of the New York State Conservation Department. Is it possible to bury a person in their own backyard? 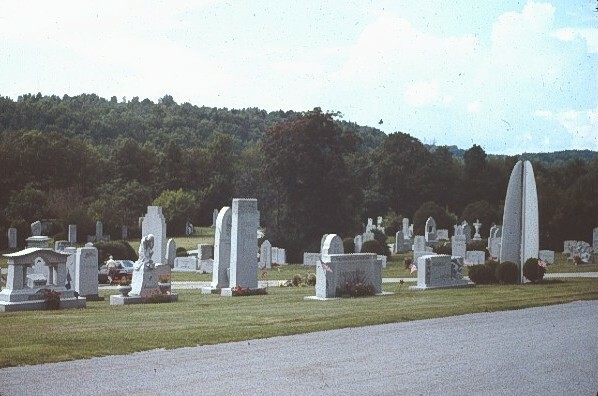 According to the Ulster County Health Department, Sanitation Division, the procedure is to have a licensed land surveyor designate land determined for a family cemetery. A deed has to be filed with the County Clerk's Office. 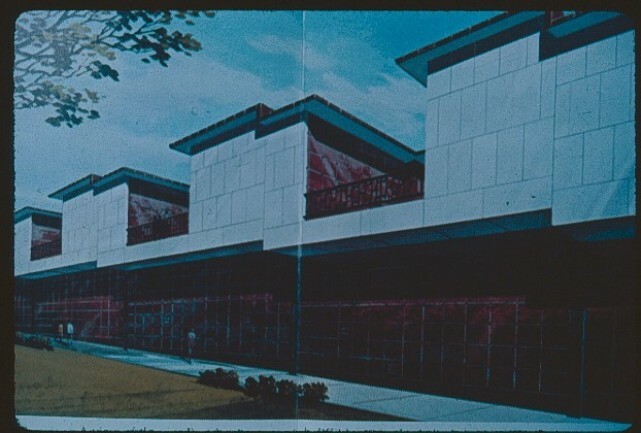 The New Paltz Town Law, Section 140-39 states, "No burial or memorial plats or buildings shall be located closer than fifty (50) feet to any residential lot line, except that when a dense evergreen hedge or a wall or landscaped strip at least six (6) feet in height providing a complete visual screening from all adjacent residential property is provided, burial or memorial plats of less than six (6) feet in height may be located no closer than twenty (20) feet from any residential lot line. Crematories shall be located only in cemeteries." 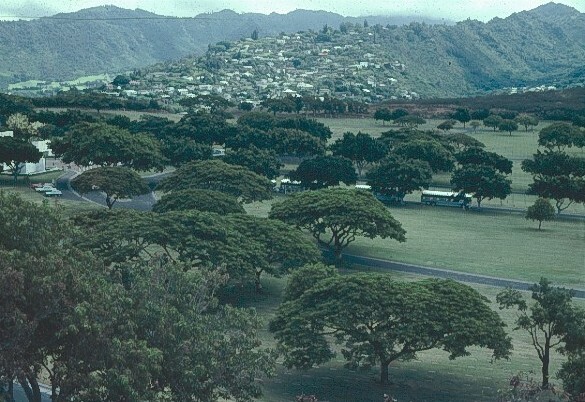 It is implied that land designated for a cemetery may not revert back. Also, according to NY State law if a cemetery is abandoned for more than 14 years it becomes the property of the town and they are mandated to maintain it. Fortunately decomposition is the end result of death. To reduce a body to fluids and gases keeps the world from getting cluttered with remains. This is the ultimate form of recycling! Do in the air and the resulting gases are mainly carbon dioxide and water. 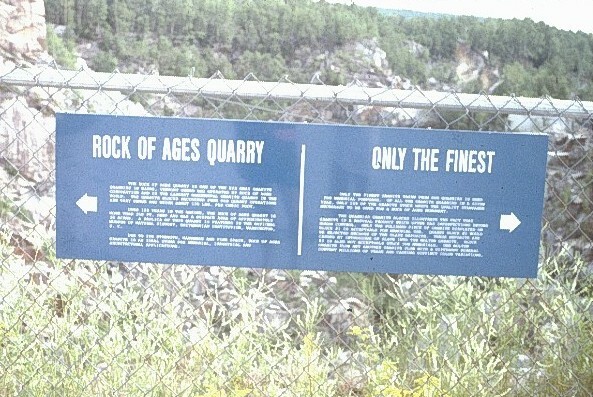 Done without oxygen, such as in a sealed casket/vault and the oxygen is quickly used up and the resulting gases are hydrogen sulfide, ammonia, and methane. Phew! Mold will be present. The body may be covered. There may be long whiskers of Penicillium. "John Brown's body lies amouldering in the grave." As we live there is a constant battle going on between those organisms that would like to devour us and those that keep them from doing it. Saprophytes and parasites against white blood cells. Pathogens against antibodies. Keep healthy and strong and the bad guys are kept at bay. If you have ever had the opportunity to watch something decay it must have been fascinating. If the animal was intact, that is, it was not punctured by a bullet or some other object, the bad guys (mainly Welchi bacillus in humans) start devouring cells and producing gas. The swelling is incredible! It can make an arm or leg one-third larger. It can pop a vein in the forehead causing the funeral director to have second thoughts about open-casket visitation. Eventually the skin can no longer take the stretch and splitting occurs. Or, the exterior might be penetrated by borers such as maggots and fungi. The latter appears as coiled bedsprings in color. Hence, "John Brown's body lies amouldering in the grave." At the same time the critters are producing gas they are releasing the fluid portion of the cells. 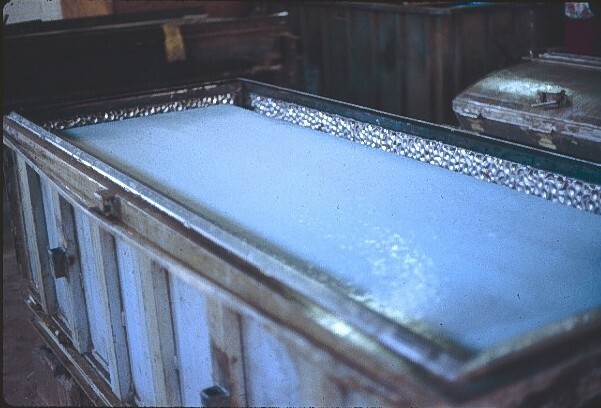 Now that the exterior has been penetrated the gases and fluids begin escaping to the environment. This leakage is quite unpleasant. 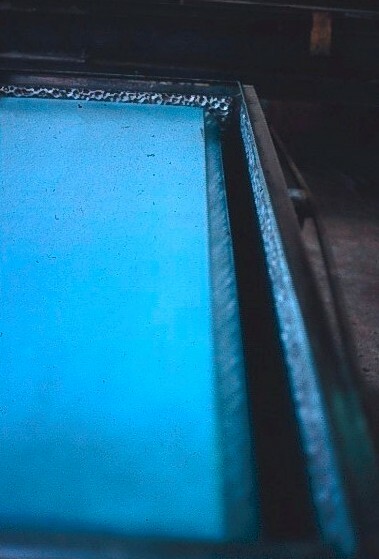 The fluids stain the lining of the casket and the gases will leave a smell that is impossible to forget and remove. As the story goes, a man committed suicide in a Corvette sometime in July. The decomposition over several days in this mini-greenhouse resulted in the loss of the car because of lingering odor. Even though the new owner of the car tried everything to rid the smell from the interior it was not possible and the car had to be destroyed. As the marinating continues and the gases and fluids are released the body gets flatter and flatter. A raccoon road-kill looks like a miniature rug. Only the bones keep the flesh from completely collapsing. Eventually the skin is devoured and the bones dissolve as long as the conditions are not too dry, hot, or cold. This final process may take many years. A downer's decomposition has its own set of rules. Again, much of it depends upon the environmental conditions of the body of water. If the drowner submerges in cold water, such as a lake in the winter or into deep water, the process will take a longer time. In any case, the gases will accumulate to the point where the density of the body becomes less than water and it floats to the surface. Water organisms such as shrimp may enter the orifices. They will introduce more critters to speed up the decomposition. 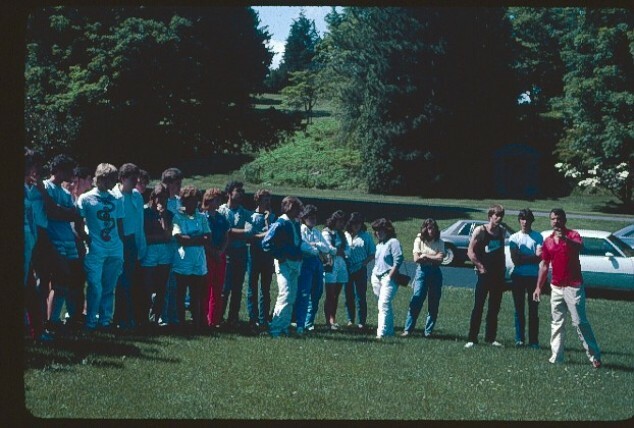 I had the unpleasant experience of recovering the body of a 14 year-old kid from a Candlewood Lake in Connecticut in 1957. The boy drown after the boat he was in made an abrupt turn tossing him into the water. As the boat circled around he attempted to grab it, missed, and had his throat cut by the propeller. Being one of the few rare hard-to-find scuba divers, the Connecticut State Police called me for assistance in the search and recovery. After several days of searching the body was brought to the surface from about 50 feet of water. Because the water was cold at that depth (39 degrees F) the gases had not accumulated to the point of raising the body. The gas was generated in the body under pressure. As the body was raised from the water to the police boat it was necessary to continue to breathe from the scuba because of the horrific odor streaming out due to the pressure difference. In fact, the body was quickly brought to the shore and placed in a plastic bag by a local funeral director. When the bag was sealed it blew up like a balloon! A friend of mine was fishing in the Hudson River and spotted what he thought was a piece of flotsam. It was the body of a woman. She stunk so bad he took his anchor line and tied it around one of her arms so she could be towed to shore. After rowing to the nearest marina he had someone call the police. When the body was hauled in only an arm was attached to the rope! The rest was later recovered.